The 2018 Poppy Half Marathon races will be held this coming Saturday with sold out fields. The Poppy Half Marathon itself, plus the 10k, 5k and 100k team event, will take place along Bexhill seafront. Race numbers, timing chips, t-shirts etc are to be collected on the day at registration, which will open at 8.30am at the De La Warr Pavilion. The 5K will start at 10am, the 10K at 11am, and the kids’ 500m fun run and youth golden mile from 12-12.15pm. 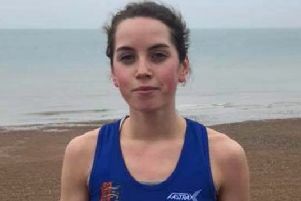 After that the National Anthem will be sung by Hannah Bradbeer, the Last Post will be played and there will be a two-minute silence prior to the Poppy Half Marathon, which will be started by town mayor Cllr Azad. All the events will start and finish from the lawns outside the De La Warr Pavilion, and follow a seafront route in between. The average age of entrants over the three distances is 43, the oldest being 84 and the youngest 13. There’s an international flavour to the event, with entries coming from as far afield as Australia and USA. This year’s event - which will be the 11th running of the annual Poppy Half - will mark 100 years since the signing of the Armistice which ended World War I. On the World War I theme, The Bergen Runners - including Dean Baker, Lee Holdaway, Paul Atkinson, Mark Jordan, Thomas Jordan, Anthony Pitt and Kate - will all be running with 50lb of weight as part of the Bergen 50lb Challenge. They are doing so in honour of all the soldiers who fought during World War I and who would have carried a 50lb backpack (about 22.5kg), plus a rifle, in full army fatigues, including a steel hat, in the trenches, in the rain back in 1914-18. They have a target of raising £1,000 for Raising Money for Good Causes, which supports local organisations helping and educating young people to improve their health, and they have a Just Giving page for anybody wishing to donate. Organisers are appealing for volunteers to act as marshals, be it for a couple of hours or the whole day. All the jobs are in and around the De La Warr Pavilion. The inaugural Charity Music Fest will take place at the De La Warr Pavilion during the evening. Hosted by Lennie George, the music fest will feature performances from The Cavaliers, the UK’s number one tribute act Natalie Black as Adele, The Chandeliers and up-and-coming local singer Erin Rose Bingham. Doors will open at 7pm for a 7.30pm start and tickets are available through the De La Warr Pavilion Box Office.